The special 20th anniversary of the International Symposium on Online Journalism (ISOJ) will take place from April 12-13, 2019 at the Blanton Museum of Art on the University of Texas at Austin’s campus. Reserved hotel room blocks are now full at the AT&T Inn and Conference Center and the DoubleTree Suites Hotel. You can find more information about other nearby hotels — along with transportation and parking details — below. Reserved hotel room blocks for the AT&T Inn and Conference Center are full. 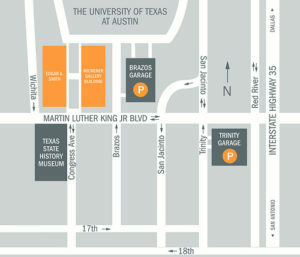 The AT&T Inn and Conference Center (1900 University Ave.) is within walking distance of the Blanton Museum and located on the University of Texas at Austin campus. A room rate of $189 per night is available for ISOJ guests from April 10-14. Visit this link to make a reservation online, or call (512) 404-3600 and mention the group code JOURNA0419. Cancellations must be made 72 hours in advance of arrival. Hotel parking is available on a first-come, first-serve basis, although there is no guaranteed availability. Reserved hotel room blocks for the DoubleTree Suites Hotel are full. 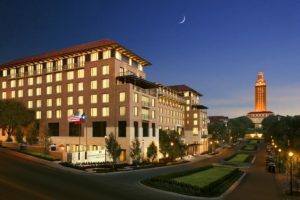 The DoubleTree Suites Hotel (303 W 15th St.) is within walking distance of the Blanton Museum. A room rate of $220 is available for ISOJ guests from April 9-14. Cancellations must be made 72 hours in advance of arrival. Valet parking is available for $25 per day. To make a reservation online, visit this link or call 1-800-222-8733 and mention the Group Code COC. 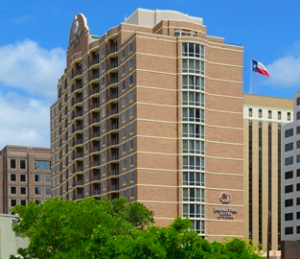 There are many hotels in downtown Austin that are just a short drive away from the ISOJ venue. Uber, Lyft, Fare, Fasten, Ride Austin are also available options.